An information sign overlooking the boats waiting for passengers to board the tour that takes them up Western Brook Pond in Newfoundland, Canada. 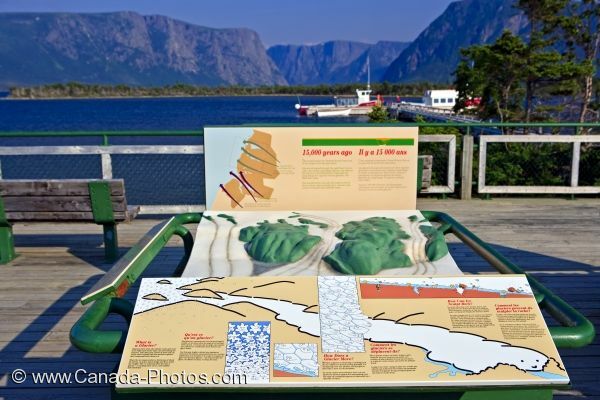 On the wooden viewpoint you can sit and enjoy the scenery of the Western Brook Pond in Gros Morne National Park in Newfoundland, Canada and read all the information on the sign relating to the area. Along the pier, there are boat tours that take you into the real wilderness and beauty of Western Brook Pond. Sign at the boat dock for tours onto Western Brook Pond, Gros Morne National Park, UNESCO World Heritage Site, Viking Trail, Trails to the Vikings, Highway 430, Northern Peninsula, Great Northern Peninsula, Newfoundland Labrador, Newfoundland, Canada. Picture of the sign explaining the area of the Western Brook Pond in Newfoundland near the loading dock for the boat tours.